By popular demand, we are releasing the ability to create and generate reports from your very own InflatableOffice account. Lucky you. We realize that there is likely more work to do here, but it's a great start. Currently reporting only occurs from the leads page. The first step is to tell the software what leads you want in your report by using the filters on the left side as shown below. You can also use preset filters as shown below in the center. We've added a couple more just for fun. 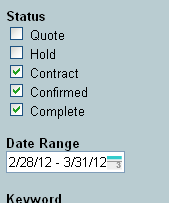 You can also order the data by clicking on any of the sortable columns, such as the Date column pictured on the right. Here is where you define the columns that you want in your report and their order by dragging them into position as shown below. Columns are sorted alphabetically in the available columns box. After you've defined your columns, you can choose to group by a certain column to force dollar values to sum if you want. If it is a report you will use frequently, you can save it for quick retrieval later. When you are ready to see your report, either use the Export button to send it to Excel, or use the View button to open a new browser tab with the report in it. 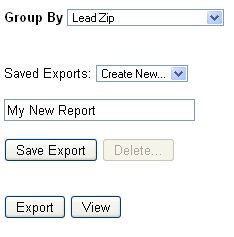 After saving the report, it is accessible below the leads filter via the quick report drop-down for quick access. To get started, we've pre-populated your account with a couple reports. As always if you have questions, problems, or need help, don't hesitate to contact us!